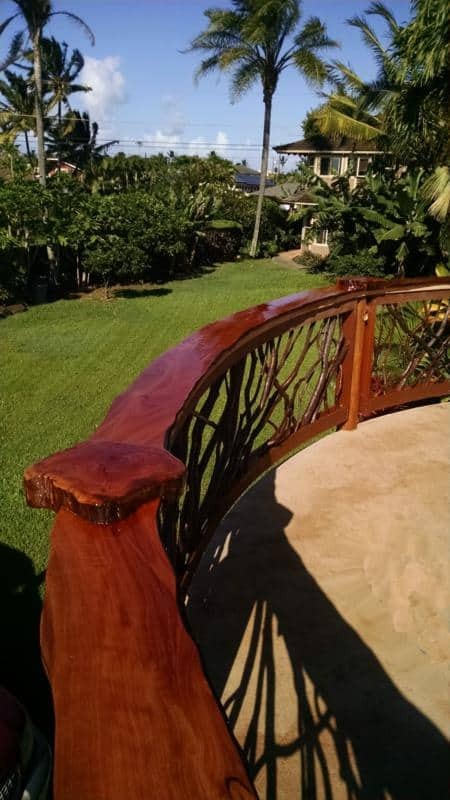 Aloha from Mountain Laurel Handrails certainly captures the essence of an extraordinary curved railing system, custom built for a home in Hawaii! 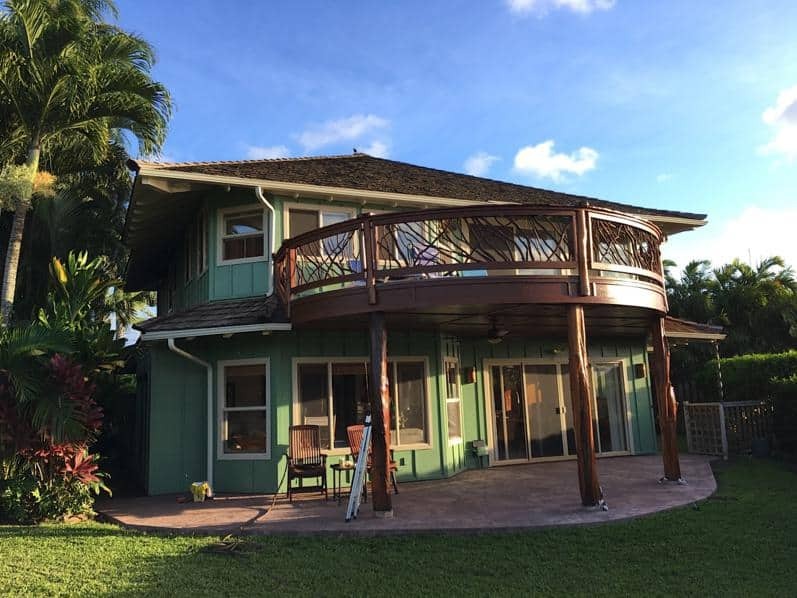 It features a sweeping curve, along with the use of indigenous materials, such as Lychee and Ohia wood, and unique Laurel branches. Take a look at how it all comes together to create a very special railing system. Of course, bent or rounded railings add complexity and some difficulty to the design. 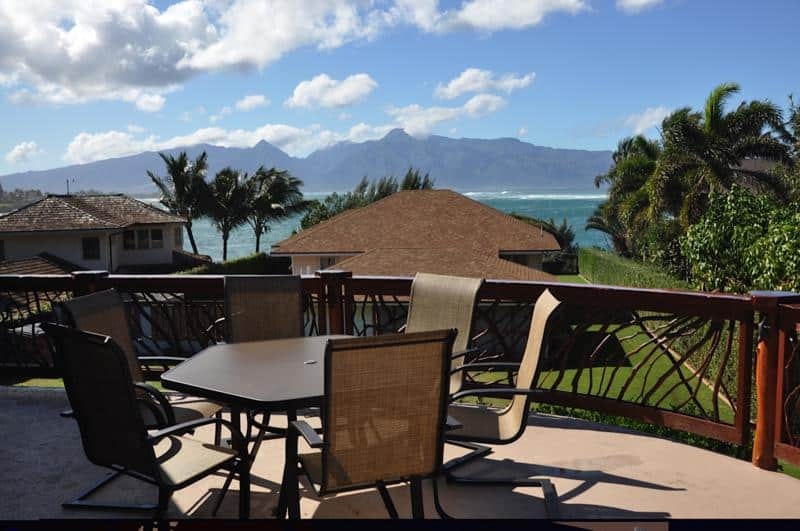 Even so, you can see the amazing results based on high-quality and artistic masterwork of Mountain Laurel Handrails and local craftsmen in Hawaii. The railing is custom bent to the homeowner’s specified radius. This is the challenging part since it entails the utmost of precision to implement. Here, it’s a generous arc sweeping around the entire upper level deck. 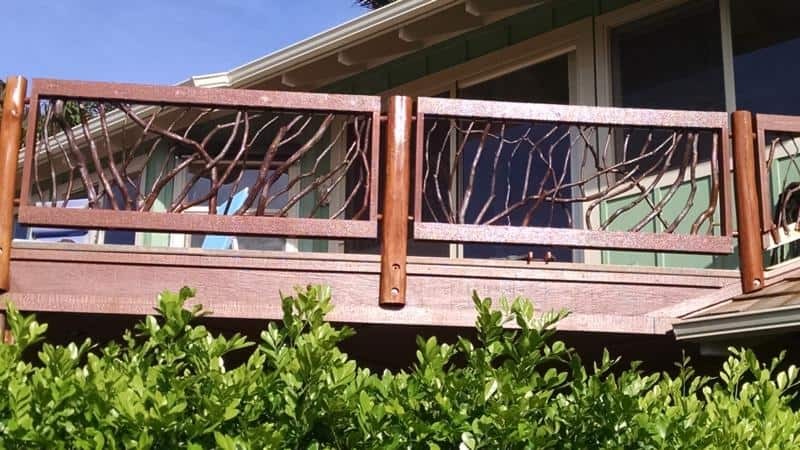 Mountain laurel branches fill the railing system with their natural beauty. 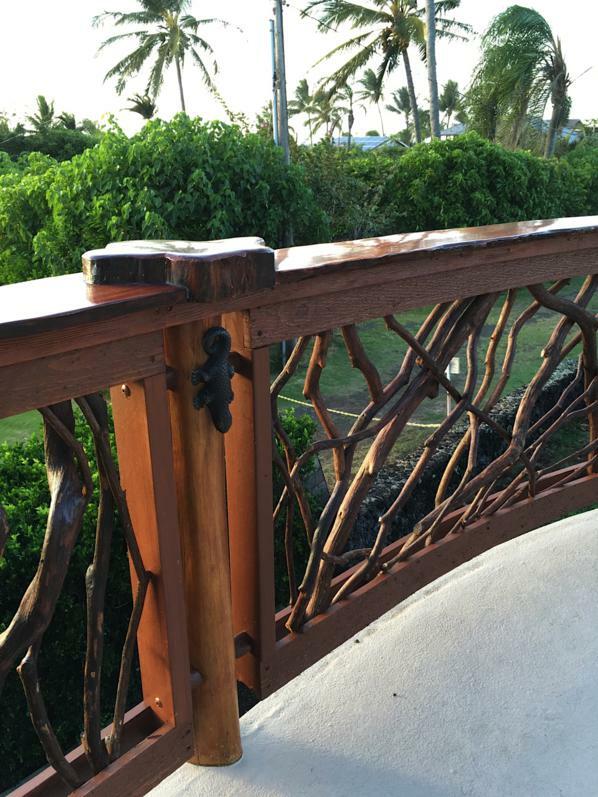 The reddish-brown color of the twigs pair perfectly with other railing components made from Lychee and Ohia trees. 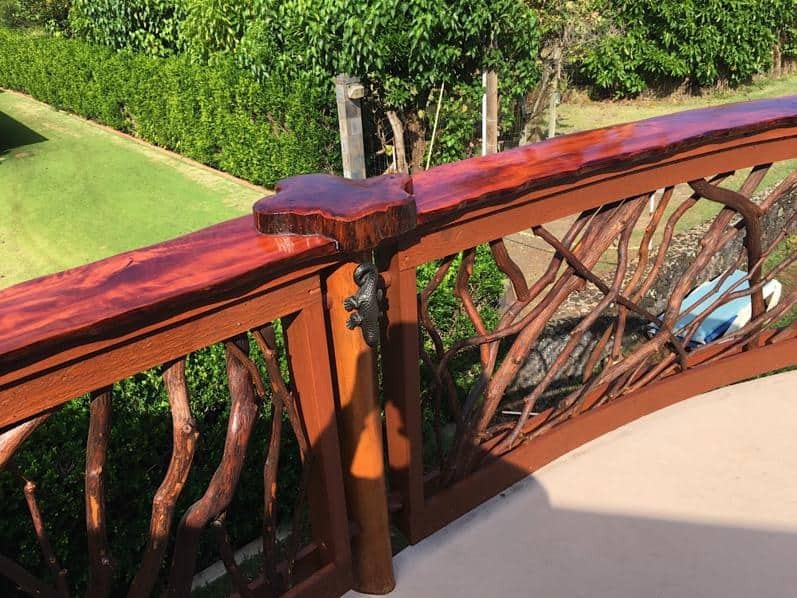 While the curved railing system itself is extraordinary, the design is topped off with a handsome top rail crafted from Lychee wood. This subtropical fruit tree is popular in Hawaiian gardens and landscapes. Lychee features reddish brown wood with a dense quality. As such, it radiates an amazing polish as you can see in the pictures. Additionally, spherical Lychee cross sections cap the newel posts along the railing. Although it’s a small detail, it certainly packs a punch of visual interest. 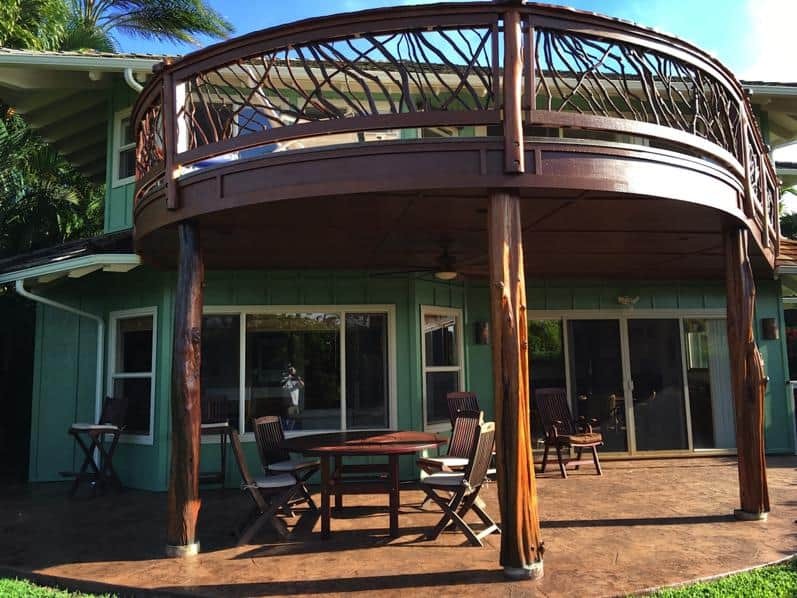 The picture above shows custom made posts crafted from Ohia wood. Like Lychee, Ohia is another flowering evergreen tree. It’s a native species commonly found in the Hawaiian Islands. 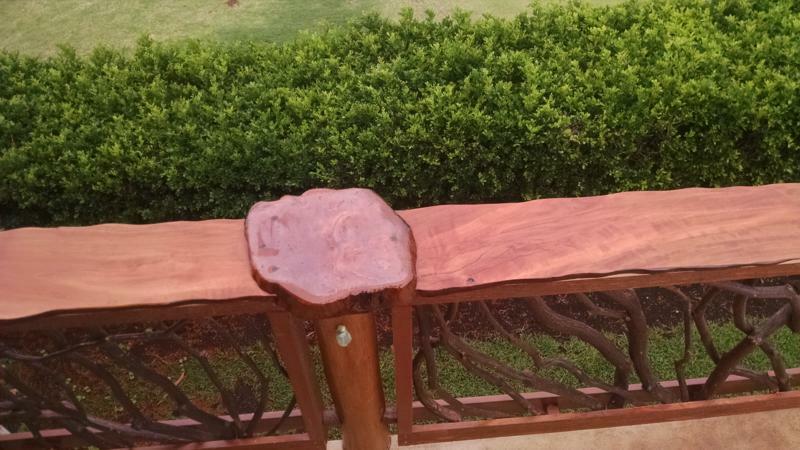 Wood from the Ohia tree is hard with a fine texture and also displays a light to medium reddish-brown hue. 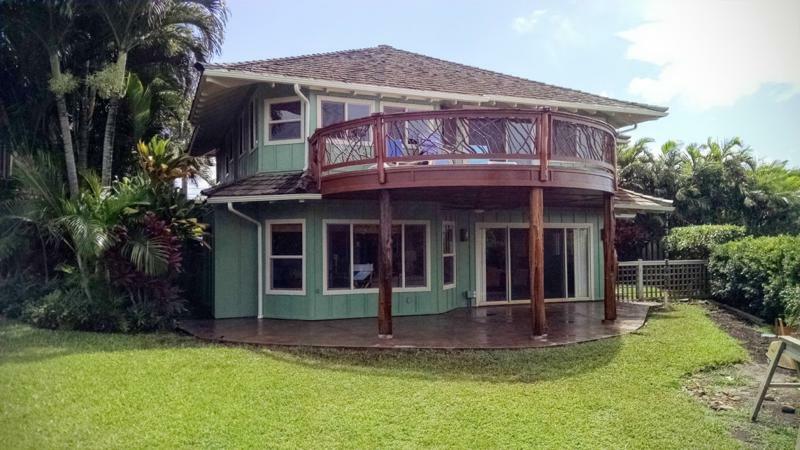 The novel use of indigenous materials helps to preserve the architectural integrity of the Hawaiian Islands. 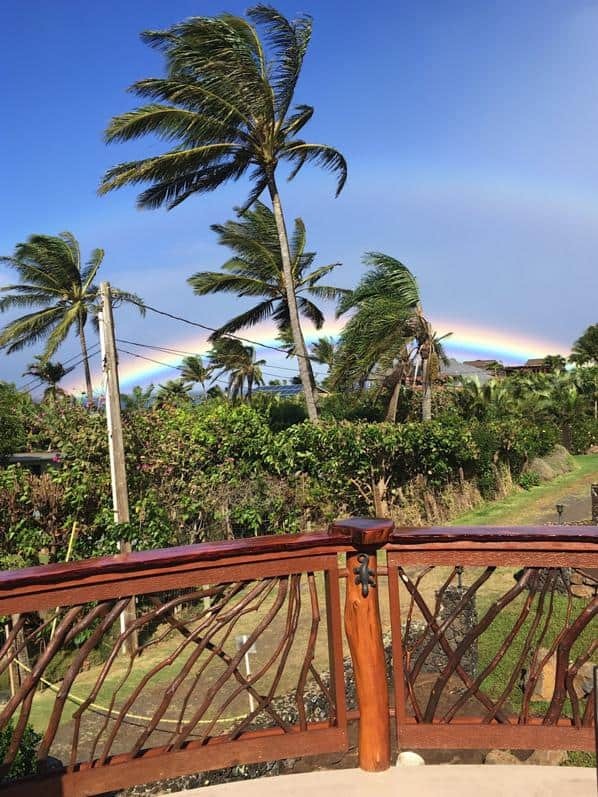 Aloha from Mountain Laurel Handrails with a Rainbow! Ultimately, decks are for enjoying and relaxing. 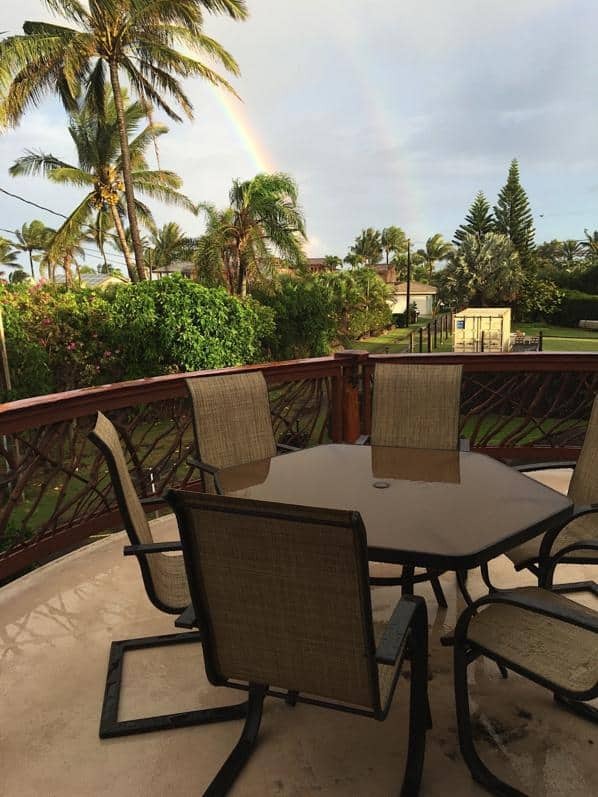 The homeowner captures one of those precious moments with a snapshot of a rainbow highlighting a peaceful view of the Pacific. Incidentally, notice how beautifully branch balusters blend with the landscape. 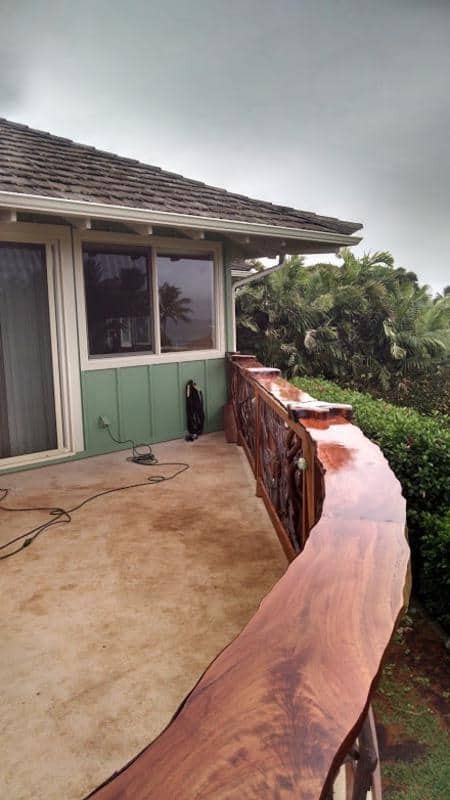 I hope you enjoyed our post–Aloha from Mountain Laurel Handrails. If you have any questions about the particulars of curved railings, please contact us at Mountain Laurel Handrails.